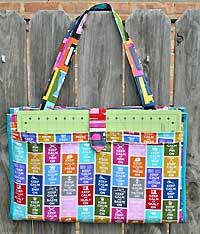 The Camp StitchALot bag pattern by Sew Sweetness is a large bag that has a specific purpose: toting all of your crafting or sewing supplies with you wherever you go! 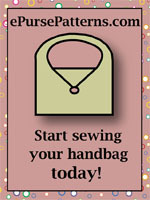 Although it would also be perfect for an art student, this tote pattern was designed with the weekend sewing retreat in mind. 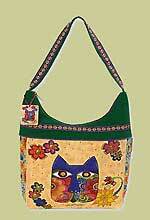 Features of this bag pattern include outer pockets for a 12” x 18” cutting mat, books or magazines, and/or quilt rulers. The front pocket has a handy flap and optional decorative button. 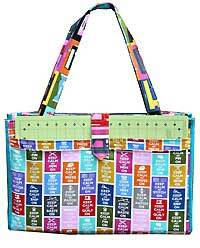 To get to all of your other crafting supplies, the bag opens up completely flat so you can see everything at a glance! There are 4 inner zippered pockets made from clear vinyl which can be customized to fit smaller sections of supplies just by topstitching the vinyl. Finished size is 20" long x 14" tall. 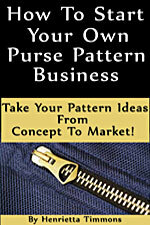 Pattern pieces are included for the front flap and front pocket. 1-1/2 yards of Lining Fabric (Note: There are 3 pockets on the back of the bag, and 2 of them are mostly hidden (because of the first pocket); you may decide to use a less-loved fabric for 2 of the 3 back pockets.